Just received this from Robert at VillainWorks. The guy is a Fett Painting genius. ...These two kinda look like they belong together. What a cool paint job. So very nice. I reckon it would, seeing them together. Does it give u goose bumps putting them together. Absolutely. In fact, now that I have my ESB TK, ESB Vader and ESB Fett together, I'm all kinds of giddy. ...kinda makes me want to finish this off my ESB collection with the ATAT driver and a Snowtrooper helmets. I'd like like to add the Tie Pilot helmet to my ANH RS HDPE TK and my SL Vader helmets. 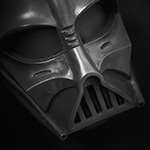 Then eventually add the ROTJ Fett, Bikers Scout helmet, and the ROTJ TK bucket to my Ghost Host ROTJ Vader.